SHE WILL BE MISSED: Bi Kidude, Zanzibar’s Taarab singer who lived for over 100 years has died. “I cannot say that I know myself,” she once told a journalist, “but my birth was at the time of the Rupee.” The Rupee, which replaced cowry shells as a medium of exchange, was introduced by Asian traders on the East African Coast before the German invasion. Many, many years ago, somewhere in the Mfagimaringo village of Zanzibar, a baby girl was born on a date that remains a mystery. The birth was premature, and so the tiny baby girl, wrapped in the clothes of the time, struggled to survive the first few days of her life. And survive she did, even though her uncle had reservations about that. The man had been among the first who trooped in to see the new bundle of joy, but what he had seen had deflated his hopes. “This is hardly a baby,” he is said to have exclaimed. “It is just a teeny-weeny little ‘thing’”. The uncle, however, did not say those words in English, but in the Kiswahili tongue of the people of Mfagimaringo. ‘Teeny-weeny little thing’ translates to kidude in Kiswahili, a word used to describe anything that is so small that the speaker lacks the adjectives to explain it. Yes, Fatuma Binti Baraka was that tiny, and that kidude description stuck on her until her death last week, only that this time it was not used in the quasi-derogatory manner of her formative years, but as a stage name for a woman who had become the face and voice of Zanzibari music. Bi Kidude travelled the world using the name, and wherever she went the crowds related it Tanzania’s rich cultural heritage. Despite a career that span across decades, much of Bi Kidude’s life story is uncorroborated. There are numerous fables about her exploits in Oman and other Arab countries as she toddled her first steps in the world of music and entertainment, but few of these have been backed up by material evidence. Also worthy of note is the fact that her age, estimated at about 100 years, had not been confirmed by the time she died and was only based on her accounts and the guesstimates of Swahili historians. As a child, she quickly gained prominence courtesy of her fine voice and, in the 1920s, sang with various cultural troupes, combining an understanding of music with an equally important initiation into traditional medicine. After running away from a forced marriage at the age of 13, she moved to mainland Tanzania, from where she toured East Africa with a Taarab group. In the 1930s, she ended up in Dar es Salaam, where she joined the Egyptian Musical Club before returning to Zanzibar in the 1940s and acquiring a small mud hut that was to become her home for years to come. But, her age and formative years aside, Bi Kidude was no doubt a musical marvel, seen through her first performances and compositions by Siti Binti Saad, the first female singer on the Isles who singled her out in her teens for her vocal ability. The “Grand Old Lady of Taarab”, as Bi Kidude was known, went on to carve a major effect on the music and culture of Zanzibar. Singing in Arabic and Kiswahili, she influenced the evolution of Taarab, a music style that originated in Egypt and is usually accompanied by fiddles, flutes, drums and rattles. From the teachings of Siti Binti Saad, she went on to conquer the world through her songs, such as Muhogo wa Jangombe, which was later re-done by Lady Jay Dee. In 2005, Bi Kidude received the prestigious WOMEX Award for her outstanding contribution to music and culture in Zanzibar; and, in a documentary titled As Old As My Tongue by Andy Jones, she was depicted as a living legend of Zanzibar. Rebecca Corey, the managing director of Busara Festivals in Tanzania, says Bi Kidude will go down history as an artiste who advertised the country’s rich cultural heritage and history. “She was exceptional in promoting the country’s identity wherever she went and was a great role model to many,” says Ms Corey, adding that the fallen star was the greatest musician to ever have graced the Taarab genre, and that she was “unstoppable”, not even by age and poor health. In one of her many interviews, Bi Kidude admitted that her earliest performances were for Arab traders on the Isles, and that she would dress as a sailor boy. She never wore shoes because she “was born barefoot” and believed wearing shoes “would weaken her”. Bi Kidude was an active participant in initiation ceremonies, where she prepared young Swahili women for their transition through puberty, taught women how to live with their husbands, and lectured against sexual abuse and oppression. She never had any children, and whiled away her time smoking cigarettes and, every now and then, swigging her favourite gin, Konyagi. But alcohol and Islam do not mix, so this obsession with the bottle irked many of her family members and close friends. She, however, explained that she only did it “for fun”, and that her religious beliefs and morals were still intact. Bi Kidude owned a small house in Zanzibar where, towards the end, she settled down to a life grounded in the roots of the society. Apart from singing, she also made a living off body painting and making henna and wanja, the dark-coloured cosmetics used to draw flowery patterns on the bodies of Muslim women, especially for ceremonial purposes. A favourite of sultans, presidents and sailors, her story is remarkable; a challenge to most people’s perception of age and of women in the Muslim society. That is why she was, in 2011, nominated for the best collaboration at the Kilimanjaro Music Awards with a local group called Offside Trick for Ahmada, a popular song in Tanzania and across the border in Mombasa and Nairobi. The following year she was awarded the all-time Sports and Culture award by President Jakaya Kikwete. Renowned veteran Tanzanian musician Bi Kidude has died. Bi Kidude, whose full name was Fatuma Binti Baraka, died on Wednesday at her nephew’s home in Bububu, Zanzibar, after a long illness. “We are taking her body to her home at Raha Leo, Unguja. She will be buried today,” said a close relative Baraka aka Rasta. In September last year, word went round that she had died but it turned out she was in hospital. Although Bi Kidude’s date of birth is unknown, many claimed that she was more than 100 years old. Much of her life story is uncorroborated with claims that she lived in Oman and other Arab countries giving her an almost mythical status. Even in the twilight of her career and suffering the ravages of ill health, which doctors said was due to her advanced age, she would still pull in crowds whenever she performed mostly taarab songs. Her last performance was at a festival in February. In the 1920s, she sang with cultural troupes, and was also introduced to traditional medicine. After fleeing from a forced marriage at the age 13, she moved to mainland Tanzania and toured mainland East Africa with a taarab ensemble, visiting all the major coastal towns barefoot. She never remarried and died childless. She was well-known for performing the “Unyago” an initiation ceremony that prepares teenage girls for adulthood. She also used traditional rhythms to teach women how to pleasure their husbands. She went on to conquer the music world through her songs such as Muhogo wa Jangombe which was re-done by Lady Jay Dee her performing prowess. In 2005, Bi Kidude received the Womex award for her outstanding contribution to music and culture in Zanzibar and she was a favourite of sultans, presidents and the public. Fatuma binti Baraka (c.1910s – 17 April 2013), aka Bi Kidude, was a Zanzibari-born Tanzanian Taarab singer. She is considered the undisputed queen of Taarab and Unyago music and was also a protégé of Siti binti Saad. Bi Kidude was born in the village of Mfagimaringo, she was the daughter of a coconut seller in colonial Zanzibar. Bi Kidude’s exact date of birth is unknown, much of her life story is uncorroborated, giving her an almost mythical status. In 2005 Bi Kidude received the prestigious WOMEX award for her outstanding contribution to music and culture in Zanzibar. She died on 17 April 2013. Her fame has been widely acknowledged throughout the local Zanzibari and Zazibari tourism community, with the luxury hotel on the island, ‘236 Hurumzi’, naming their restaurant ‘Kidude’ in her honour. She was often found residing within the lobby of this hotel in Stonetown. Bi Kidude has worked with various Taarab groups, but her first solo work is called Zanzibar, it demonstrates Bi Kidude at the peak of her performing power. PORT VICTORIA, Seychelles, November 13, 2013/African Press Organization (APO)/ – Maritime forces from the United States, 10 East African and two European nations, along with several international organizations, commenced the multinational maritime exercise Cutlass Express 2013, Nov. 11. Exercise Cutlass Express 2013, held in several operational areas in waters off East Africa, is an at-sea maritime exercise designed to improve cooperation, tactical expertise and information sharing practices among participating nations in order to increase maritime safety and security in the region. The week-long exercise will take place in the vicinity of four different naval hubs: Mombasa, Kenya; Djibouti, Djibouti; Dar es Salaam, Tanzania; and Port Victoria, Seychelles. The exercise will feature in-port phase activities before practicing naval concepts at sea. Dr. Ibrahim Mohamed Abdelrahim, Head of Liaison from the East Africa Standby Force, echoed Jackson’s sentiments at the ceremony and expressed the importance of cooperation and collaboration in ensuring maritime security. “We East African nations have benefited greatly from the exercises and activities that our forces have completed; we look forward to this week’s exercise,” said Dr. Abdelrahim. Cutlass Express aims to test a wide variety of skills such as maritime boarding, medical response, radio communication, and information sharing across regional maritime operations centers (MOCs). Participants will execute tactics and techniques within scenarios that mirror real-world counter-piracy and counter-illicit trafficking operations as well as actions taken to deter illegal fishing. Exercise Cutlass Express, in its third year, is one of four Africa-focused regional “Express” series exercises facilitated by U.S. Naval Forces Europe-Africa/U.S. 6th Fleet. The exercise is part of a comprehensive strategy of U.S. Naval Forces Europe-Africa/U.S. 6th Fleet and U.S. Africa Command (AFRICOM) to enable African partners to address maritime security concerns. The exercise serves to demonstrate and test skills that are developed as part of Africa Partnership Station (APS) and ongoing efforts to increase maritime domain awareness. Started in 2007, Africa Partnership Station is an international security cooperation initiative, facilitated by U.S. Naval Forces Africa, aimed at strengthening global maritime partnerships through training and collaborative activities in order to improve maritime safety and security in Africa. “This year we have 13 nations participating. Such a high number represents the outstanding cooperation we are seeing in this region, a cooperation that we hope to see continue to increase as a result of this exercise,” said Jackson. Participants in Cutlass Express 2013 include Djibouti, Kenya, Uganda, South Africa, Seychelles, Mauritius, Mozambique, Tanzania, Comoros, Yemen, the Netherlands, Denmark and the U.S. Representatives from the Eastern Africa Standby Force, NATO, and EU Naval Force will also participate. KISUMU, – A maize research facility designed to reduce the time it takes to research and develop varieties resistant to viral maize lethal necrosis (MLN ), which has been reported in East Africa since 2011, is to be established in Naivasha, Kenya. The facility, funded to the tune of US$1.2 million by the Bill and Melinda Gates Foundation, is expected to be operational by the end of September 2013. “The facility will enable public and private sector institutions that are engaged in the development and delivery of improved maize varieties in Eastern Africa to screen their breeding materials [including inbred lines and hybrids] under reliable disease screening procedures,” Boddupalli Prasanna, an MLN researcher with the International Maize and Wheat Improvement Center (CIMMYT), told IRIN. “This will help in identification of MLN-resistant maize lines that can be used by these organizations to develop MLN-resistant elite maize varieties that can replace the existing susceptible varieties in the market,” he added. The facility is expected to serve as a hub for training young researchers and students in Africa on MLN screening and for identifying MLN-resistant maize germplasm. Maize virologists from CIMMYT, the Kenya Agricultural Research Institute (KARI), the International Institute of Tropical Agriculture (IITA) and institutions in the USA (e.g., Ohio State University/US Department of Agriculture) will work together at the facility. MLN first appeared in Kenya’s Rift Valley in 2011 and quickly spread to other parts of Kenya, as well as to Uganda and Tanzania, according to CIMMYT. MLN occurs after combined infections by two viruses – maize chlorotic mottle virus (MCMV) and either maize dwarf mosaic virus (MDMV) or wheat streak mosaic virus (WSMV). Infected maize plants are short; their leaves show chlorosis (indicating insufficient chlorophyll and thus pale in colour) and they die at about flowering time. MLN can cause total crop loss if not controlled effectively. Infected plants are frequently barren; ears formed may be small or deformed and set little or no seed. In 2012, the disease affected an estimated 300,000 smallholder farmers in Rift Valley , traditionally Kenya’s largest maize producing region. This year alone, the government estimates the disease has affected some 18,500 hectares. Recent research carried out in Kenya by CYMMIT and KARI featuring 119 commercial maize varieties artificially exposed to the virus during 2012-2013, revealed that as many as 117 were susceptible to MLN. Experts like James Samo, an agricultural production officer at Kenya’s Ministry of Agriculture, say unless the disease is controlled, it could lead to a shortage of maize, as farmers might decide to turn to other crop varieties. “When you talk to farmers, they tell you it is not profitable to grow maize any more and this can lead to serious shortages of the crop and in turn, food insecurity. Remember that maize remains the food of choice for many people in the region,” he said. Some farmers told IRIN they plan to plant alternative crops should efforts to control the disease fail. “Last year alone, I lost crops to the disease worth $1, 200. Come this year, I thought the government would come up with lasting solutions but that never was. Even this year my crops have been attacked yet again. I have since uprooted maize and will then plant millet come next planting season,” Daniel Tirop, a 46-year-old farmer, told IRIN. In Tanzania, cases of the disease were first reported in August 2012 in Mwanza, near Lake Victoria, and in Arusha. Experts have welcomed efforts to control the disease, saying it has devastated crops – in part due to the lack of knowledge among farmers and agricultural extension officers in identifying it in good time, and also due to its rapid spread. “Because it is a new disease both to farmers and to agriculture extension officers who are supposed to advise farmers, the disease has become very hard to control. The only option so far and which must be pursued vigorously, is to come up with maize varieties which are resistant to the disease,” Samo told IRIN. Kenya’s government has spent some $113,000 since 2011 raising awareness of MLN among agricultural extension officers and farmers. In the meantime, experts say farmers should rotate crops and diversify as a way of controlling the disease. “Some interventions include adoption of crop diversification and rotation with non-cereal crops to beat its spread. Since the vectors are insects, so controlling them using chemicals that would stay in the soil for three weeks – long enough to allow the seeds to germinate – combined with development of genetically resistant varieties, could curb the disease,” Mathews Dida, a maize virologist at Kenya’s Maseno University, told IRIN. A Kisumu High court witnessed a rare drama this week when it emerged that a lawyerrepresenting Nyando election petitioner Jared Okello doesn’t have a practicing certificate.Okello went to court early April on alleged grounds that the incumbent Mp Fred Outas victory was shrouded with election malpractices. Pascal Odhiambo the lawyer victim was conspicuously absent when the presiding judgeAggrey Muchelule ruled that all the applications done by him during the trial period be srtuck off with costs.However both parties will brace for 45 minutes each of submission before Muchelule on 8th August next month. Its imperative to note that the lawyer who filed the case Bruce Odeny is different from Pascal Odhiambo who has been arguing the case. The press could not however immediately establish whether the duo who are based in Kisumu are from the same law firm. Kisumu City based veteran journalist Leo Odera Omollo has been hospitalised. Odera now aged 76 was hospitalised a fortnight ago at Milimani hospital Kisumu ailing from multiple ailments like mild stroke, hypertension, brain tumour, and diabetes. The mercurial scribe known for his prolific political analysis is a freelance and subscribes to both local and International media outlets. He has locally worked for the Nation media Group,the then East African Standard,defunct Kenya Times and the Weekly Citizen. In the foreign outlets he is affiliated to the Guardian Newspaper of London, the New York Times (USA), among other online media. Odera has also written for this Online media outlet (API). During his hey days he was closely associated with the late Thomas Joseph Mboya, The doyen of Kenyas opposition politics the late Jaramogi Oginga Odinga, former President Daniel Arap Moi, Kanu mandarins the late Dr Taita Arap Towett and Ezekiel Barngatuny. Odera hails from Uriri constituency Migori County. During a visit by the press early this week Odera was looking frail though stable and could recognise some of his colleagues. “Mzee has now made a bit of progress comparatively”, said his wife who was glued besides him in his hospital bed. Kisumu County Government has launched an anti-litter monthly clean up initiative targeting a 75% reduction in litter in all the seven constituencies. The clean up initiative dubbed “don’t trash Kisumu” aims to improve collection, public awareness and enforcement of environmental by laws. According to Governor Jack Ranguma, the effort is not only for aesthetics but also to reduce trash flowing into the drainage system, thus decreasing repair costs. He said every first Saturday of the month will be a clean up day, within the County and the inaugural exercise will be launched on the 6th July. The program focuses on education and behavioral change and involves sustainable programs for business, educators and the community. The County, Ranguma said will also impose heavy fines for illegal dumping, and told everyone to be responsible in managing their liter within the surrounding environment they live. “We will review environmental by laws to help us enforce these anti-litter efforts and make our county one of the cleanest in East Africa,” said Ranguma. Deputy Governor Ruth Odinga said they will work closely with line environmental organizations, Universities, Churches, business Community to undertake cleaning. The Program will involve an annual litter audits and measurement of collected litter as a way to evaluate the progress toward achieving the 75% reduction goal. Ranguma and Odinga asked employees from various county departments, workers in private offices, and business elites to join in the effort to clean up Kisumu on the 6th July. Yesterday, a meeting held at Odinga’s office chaired by the Executive member for Environment Ms Rhoda Ahono resolved to mobilize residents to join the don’t trash Kisumu Campaign. The County Director of Environment John Sunday said they had an anti-litter strategy designed to raise awareness of litter. Ahono set up a clean up committee. The clean up initiative Committee vowed to reduce litter through education, maintenance and enforcement and is collecting statistics to measure its progress. The team includes, officers drawn from various County Departments and will be charged with the task of driving the campaigns. Additionally, the County also will maintain contact with the business community, Universities, churches and with land owners to help keep the areas clean. So far, more than 45 business communities and real estate owners have jumped onboard, and pledged to join the Don’t trash Kisumu initiative. Sunday said the exercise will revitalize community pride and create litter awareness. The program was developed to include individuals, businesses, organizations, schools and City departments among others. County secretary Humphrey Nakitare said he will be in charge of monthly audits of the clean up exercise. 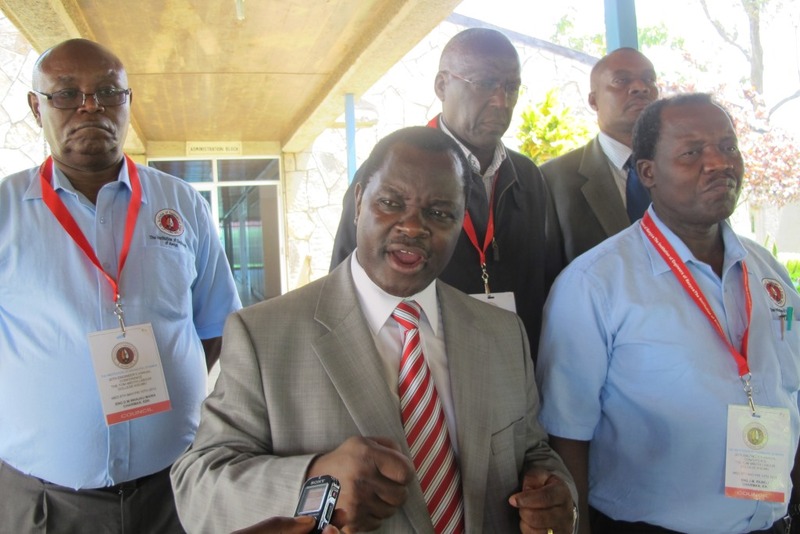 “We want to ensure that Kisumu County emerges as the role model in cleanliness,’’ he said. The problem of being or having an average child with a near perfect child and discipline is that you always be tussling to measure up and your shortcomings are likely to be magnified many times over. And that could be what it feels like to be at Ndivisi Girls High School in Bungoma East district, the next school that is literally next door neighbor to the famous Lugulu Girls High School. While Lugulu Girls is renown to be quintessence of excellence and discipline Ndivisi Girls has had its share of laying proper strategies to appear in a national map. Yet Ndivisi Girls is determined to change its images for the better,with the school Sh.18 Million project funded by webuye CDF for establishing classroom block in Ndivisi Girls High School which is a provincial school situated in the new Webuye East Constituency that now educationists believes might pose academic threat to the much revered Lugulu Girls that is now in Webuye West Constituency but within the same district. The recent book harvesting event,which saw school lovers donates book in hundreds, is considered to be one of its strategic plan aiming to turn the institution to be a centre of academic excellence and a product of high achievers that it was in the past. The initiative has been received with enthusiasm from parents,teachers and students.The school now is expects exemplary performance from Form Four candidates because teachers have already rolled up their sleeves through lead them in a series of exams and other revision materials. Gracing the colorful event,Bungoma east secondary schools head association chairperson Mr Christopher Manyonge applaueded the girls discipline as it has shown to do better compared to other years. The noble event is set to provide the girls with enough learning materials to improve its national exam results.The school has risen from a mean score of 4.3(2009)5.3(2010) , 5.792(2011)and 5.077 in (2012). On having a better disciplined body of students and flamboyant teaching staff,the school principal Mrs.Judith Wamocho has made significant strides since she took over as the principal. With a manageable population of 360 students,Mrs.Wamocho vision is to see the school stand out as an oasis of academic and sporting success. She believes the feat can only be achieved through the institution’s ability to strike a balance between academic work and co-curriculum activities. The school which in the recent past won national and the East Africa netball title,saw the gallant girls tour various parts of Africa and Kenya. API has also established that due to its growing popularity, many students and parents have been trooping to the school hoping to gain admissions. Mrs.Wamocho who is credited of her impressive development records and no-nonsense approach issues affecting her team, girls are now rolling up their sleeves for a duel of the century despite of the remoteness of the institution. She is also determined to see her girls being assimilated at the national level and is trying to establish links with more learning materials. The school idyllic setting is perfect for study and recreation.The management has also invested heavily in turning the premises green hence maintaining a clean,healthy environment while the strong Christian foundation influence puts discipline and self respect ahead of everything else. An academician,Moses Andati,who admires her style of school management,argues that if given full support both from the government and entire Ndivisi community,the institution might be one of the admired schools in the region in the near future. Attached is the school learning block that was funded by Webuye CDF. The Norwegian police got a rude shock this morning around 9 am. A man said to be from East Africa took himself to the police station in Asker, a town at the outskirts of Oslo City and told the police that he had just killed his ex-wife. The couple had recently separated and were no longer living in the same house. The man went to the ex-wife’s house where he committed the crime. The two have two children but the two kids were not in the house at the time. Reports confirm that the children were in the nursery school nearby when the act was committed. In the recent past, 6 murders of this nature has taken place in the country. It is reported that the couple had a tag of war on who should get custody of the children. The Norwegian child welfare department has now taken the chidren for placement. The man is now in police custody for questioning. Kenya is faced with shortage of qualified engineers in various sectors that might jeopardize the success of Vision 2030, Permanent Secretary in the Ministry of Industrialization Dr Cyrus Njiru has said. Dr Njiru said some of the best engineers are exported to neighboring and international countries leading to brain drain in the sector making it difficult to undertake flagship project in Kenya. Speaking during the Innovative Engineering Solutions for Industrialization of Counties conference held at Tom Mboya Labour College in Kisumu City, the PS said funding should be improved to promote engineering courses from certificate level to doctorate to meet the current demands. He added that middle colleges should be revamped in the 47 Counties as this will increase the number of students enrolled in engineering courses. “With counties in place focus now shift to the industrialization processes in these devolved units of governance to realize the objectives outlined in Vision 2030,” says the PS. Dr Njiru revealed that for a quick industrialization to be achieved, promotion of innovative engineering, scientific and technological interventions as well as providing the country the vital technical human resource should be given a first priority. He stated that industrial sector is a key driver for increasing economic growth rates, generation of sufficient employment opportunities and integrating an economy of Kenya into the global economy. “Most developed countries and emerging economies have recorded rapid economic development through embracing industrialization,” Dr Njiru said. The PS added that it is for this reason that the Vision 2030 aims at making Kenya a newly industrializing, “middle- income country providing high quality life for all citizens by the year 2030. However, it is envisaged that by year 2030, approximately 30,000 engineers will be required facilitate the flagship projects in line with newly industrialized countries. “For every engineer, 3 technologists are required and for every technologist, 4 technicians are required. For every technician, 5 craftsmen are required,” he explained. This he said translates to a ratio of 1:75 for every engineer vis-à-vis support staff required as per the Vision. The Chairman of Institute of Engineers of Kenya (IEK) Eng. James Ruingu said concern has been expressed by some employers over the quality of education and training of engineers in Kenyan universities. Eng. Ruingu said adoption and continuous updating of high quality engineering syllabus should be embraced to produce highly qualified graduate engineers in various universities. The name “Tanzania” derives from the names of the two states, Tanganyika and Zanzibar, that united in 1964 to form the United Republic of Tanganyika and Zanzibar, which later the same year was renamed the United Republic of Tanzania. The President is Jakaya Mrisho Kikwete, elected in 2005. The country changed its capital from Dar es Salaam in 1996, moving it to Dodoma, where the country’s parliament and some government offices are located. The main coastal city of Dar es Salaam was the capital between independence and 1996. Now the city is Tanzania’s principal commercial city and seat of most government institutions. Tanzania, which is officially known as the United Republic of Tanzania is a country in East Africa bordering Uganda, Rwanda,Kenya, Burundi, Democratic Republic of the Congo, Malawi, Mozambique, and Zambia, Tanzania’s Kilimanjaro mountain is Africa‘s highest. The country is divided into many regions, with five of them on the semi-autonomous islands of Zanzibar. Mungu Ibariki Tanzania na watu wake. Bless the children of Africa. God Bless Tanzania and its people. Mungu ibariki Afrika is the national anthem of Tanzania. The anthem is the Swahili language version of Enoch Sontonga‘s popular hymn Nkosi Sikelel’ iAfrika that is also used as Zambia‘s anthem (with different words) and part of South Africa‘s. It was formerly also used as Zimbabwe‘s anthem. The word Mungu in Swahili means God and the title of the anthem therefore translates as God bless Africa. In Finland the same melody is used as the children’s psalm Kuule Isä Taivaan (Hear, Heavenly Father). In this form the song has found its way to the common book of psalms used by the major church of Finland.